Sr. Rosemary - one of the world's most influential pioneers. It often happens that Fr. Tom Rosica will pile us all into a van and take us on a ‘road trip’, of sorts. This time it was just a jaunt across the border into Buffalo for this year’s Catholic Press Association Convention. The Convention was an opportunity to refine and update our skills, and meet other Catholic media professionals. There’s a palpable excitement at seeing fellow colleagues. We get to swap war stories, strategies, renew connections and walk away with lots of ideas and practical ways to implement them. This year 12 of us attended the Convention, some of the S+L team members for the first time. 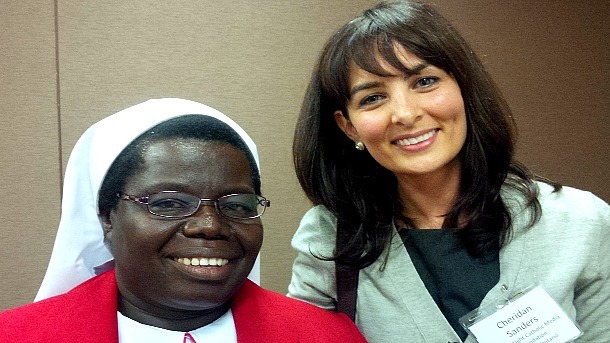 Personally I was stoked about the prospect of hearing from Sr. Rosemary Nyirumbe’s keynote. You may recall she obtained fame in the documentary Sewing Hope. Ok, if you haven’t watched Sewing Hope - stop everything that you’re doing and watch this trailer, right now! Isn’t she amazing? No wonder, TIME magazine listed her as one of the 100 most influential people in the world! To support Sr. Rosemary and her work with former child soldiers and to provide young women the opportunity to earn their own living, consider purchasing some bags or accessories for yourself or as a gift.